In the early days of spraying Bt I used an old Windex bottle to apply the fine bacterial mist. 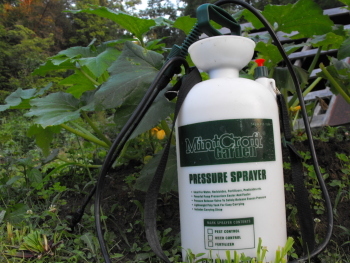 That was a mistake I repeated way too many times before I wised up and invested in the MintCraft garden sprayer. It's a well designed unit that holds a decent amount of pressure. I give it about 5 or 10 good pumps which will last through a half gallon of spraying. The extended wand allows you to easily target any area of the plant while providing a convenient control knob for mist level adjustments. It gets a bit heavy to carry if you fill it all the way up, especially if you're using the shoulder strap. You might want to upgrade the strap with some padding if you do the maximum capacity.